Neptune is the only planet that cannot be seen with the naked eye (assuming you aren’t still resisting the formal IAU definition of a planet…). It is extremely far away and very dim, so much so that it wasn’t even discovered visually – its existence had to be inferred mathematically. Herschell may have turned the scientific world on its head by discovering a sixth planet in the sky (We don’t count earth since it is under our feet and is technically the very opposite of sky), but that was only just the beginning. As astronomers got better at measuring the movements in the heavens and built better telescopes, they started noticing discrepancies. In 1821, Alexis Bouvard calculated the orbit of Uranus to the best possible accuracy and compiled an almanac showing where it would be on future dates. It was a solid piece of work, except that Uranus refused to cooperate – it kept moving away from its calculated orbit. Most astronomers attempted to solve the anomaly by taking more and more accurate measurements of Uranus’s position, assuming that this was a measurement error. In 1843, a young astronomer named John Couch Adams realised that if there was yet another planet even further out, its gravity would tug on Uranus causing tiny disturbances in its orbit. He got to work calculating where such a body should be and reached a conclusion in 1845 there must be another planet some 1.6 billion kilometers further out from the Sun than Uranus. He sent his work, along with tables predicting the current position of this new ‘Planet X’ to Sir George B. Airy, Astronomer Royal of England. Sadly, Airy was unimpressed by Adams’ youth and dismissed his work as not worth investigating. Meanwhile, a young French mathematician named Urbain Le Verrier was working on the same problem. Unaware that Adams had already done the work, he set about his own calculations and reached a similar conclusion in 1846. He sent his work to the Urania Observatory in Berlin. It so happened that the director of the observatory, Johann G. Galle, had recently charted all the stars in the very area where Le Verrier was asking them to look. On September 23 1846, Galle and his assistant found Neptune less than 1° from where Le Verrier had said it would be. Today credit for the discovery is shared between Adams and Le Verrier. The issue remained on what to call this new planet. There being no International Astronomical Union back then, it was a matter of much debate and contention (Le Verrier wanted to name it after himself) but eventually a consensus emerged. 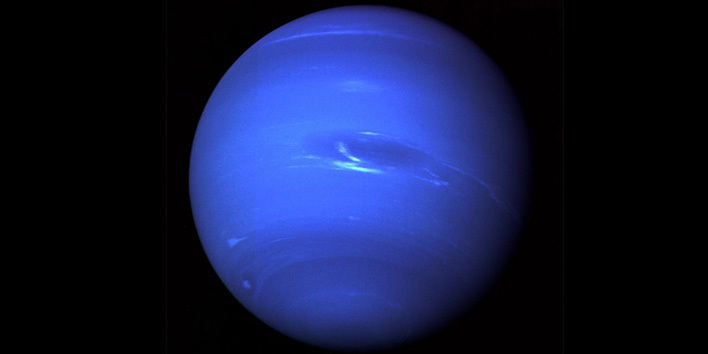 Since it appeared a deep blue in telescopes, it would be named for Neptune, god of the seas and oceans. 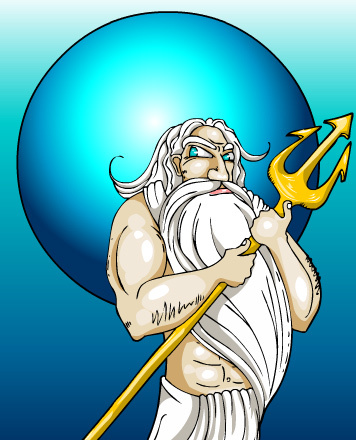 Neptune was one of the three ruling gods, along with his brothers Jupiter and Pluto. After being rescued from Saturn‘s belly, Neptune and the other Olympians warred against the Titans, eventually overthrowing Saturn as supreme ruler of the universe. Jupiter took control of the skies, Pluto took the underworld and Neptune received the waters. Neptune was armed with a trident, similar to the three-pronged spears used by fishermen of the time and he used it to stir up the oceans, smash rocks, create earthquakes and other havoc. He was the most temperamental of the three, prone to great kindness and fits of rage. He could still the wildest seas at a glance, or whip up ferocious storms and cause massive earthquakes when he felt he hadn’t been shown proper respect. Neptune is probably most famous as his Greek alter ego: Poseidon. One of Poseidon’s children was a giant cyclops named Polyphemus. Polyphemus famously captured Odysseus and his men as they sailed home after the Trojan war. Odysseus and his men escaped when they blinded Polyphemus in his sleep with a burning stick lifted from the Cyclops’s cooking fire. Poseidon was so incensed by what they did to his son that he threw storm after storm at their ship, constantly blowing them off course to dangerous islands so that it took them a full ten years to finally reach home. The story of the Odyssey is of course a very well known one, and was recorded by Homer. But what of the planet? Neptune is the smallest of the Gas Giants. It has a diameter of about fifty thousand kilometers and orbits the sun at a distance of about four and a half billion kilometers. The largest of Neptune’s eleven moons, Triton, was discovered in the same year as Neptune itself. It is a little less than half the size of the Moon, and is the only natural satellite in the Solar System which orbits in the opposite direction to its parent. This is one reason why many astronomers think that it may not be a moon at all, but a captured comet. Like the other gas giants, Neptune is composed of a small core composed of rock and metal, surrounded by a very deep atmosphere of mostly hydrogen gas compressed to enormous density. Because of its distance from the Sun, Neptune should not receive enough heat to power any significant weather, yet the Voyager spacecraft discovered continuous winds blowing at speeds in excess of a thousand kilometers per hour! Like Saturn, Neptune has a ring system and like Jupiter, it has anti-cyclonic storm features which appear as different coloured “spots” (although none as long-lived as the Great Red Spot). Neptune plays almost as important a role as Jupiter in the Solar System. While Jupiter uses its massive gravity to shepherd and constantly disrupt the asteroid belt, Neptune gently tugs on cometary bodies in the Kuiper belt, nudging them out of their regular orbits to fall inwards and become comets. These new comets are one of the risks faced by the inner planets – it is believed that the mysterious explosion over Tunguska in Siberia at the beginning of the 20th century was a comet smashing into our atmosphere and vapourising with the force of an atomic bomb. Neptune seems to be as mysterious and unpredictable as the sea, and prone to similar displays of violence. I think it is quite aptly named.